Coming into the series trailing their arch-rivals by four games in the standings, Clay Buchholz and the Red Sox were able to come out and beat the Yankees 5-4. The game started as a total pitching duel between Buchholz and Yankees' starter Bartolo Colon, with neither team being able to muster a hit in the first two innings. To lead off the top of the fourth, Alex Gonzalez continued his personal power surge, hitting his eighth home run of the season, and his seventh since May 3rd. 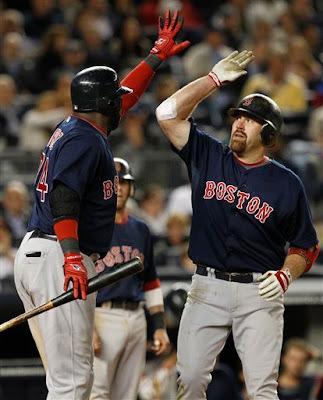 Later in the inning, Carl Crawford hit a grounder to first and was able to knock in Kevin Youkilis in the process, giving Boston an early 2-0 lead. Buchholz continued to pitch strong into the bottom of the fifth, but promptly gave up a two-run shot to Russel Martin to tie the game. Bartolo Colon was pulled with that same score after giving up a single to Jarrod Saltalamacchia to lead off the seventh. Joba Chamberlain came in for relief, and gave up a sac fly to Gonzalez, followed by a two run shot from Kevin Youkilis to give Boston a 5-2 lead. After a 1-2-3 seventh, Buchholz was pulled after allowing two runs on five hits, a walk and seven strikeouts in seven innings of work. Daniel Bard and Jonathan Papelbon worked an inning each, and each gave up a run, but the Sox held on for the 5-4 victory.